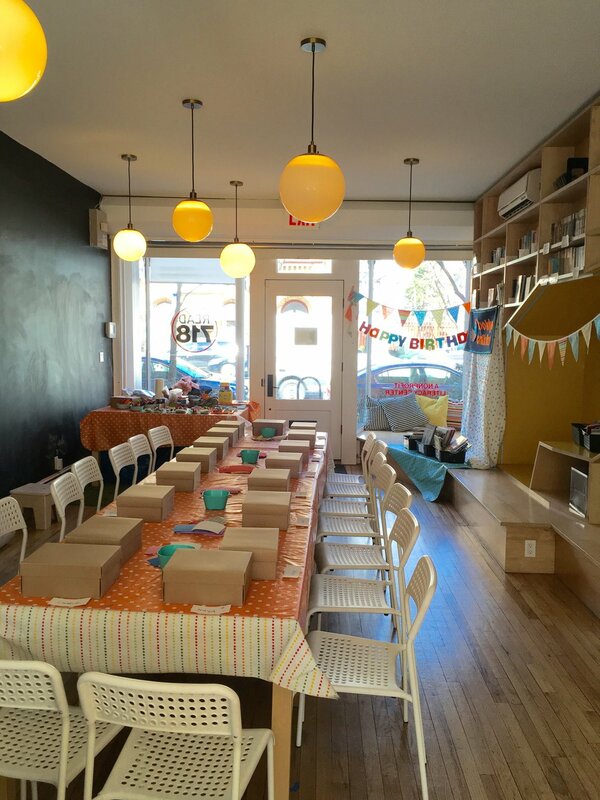 We do not have a permanent location, but rather host kids birthday parties and small events on the weekends at our lovely venue in Boerum Hill, Read 718, (see map below). Read 718 is located at 420 Atlantic Ave. Brooklyn NY 11217, between Bond St. and Nevins St. Take the F or G train to Bergen, the A, C, or G to Hoyt Schermerhorn, or the 2, 3, 4, or 5 to Nevins. *Please note we are only at the venue when an event is booked on the weekends. During the week, Read 718 is a tutoring space. * If you are interested in a weekday/weekend event or workshop at your location, we can bring the craft activity to you! View from the front and back of Read 718, our party venue.